Being a child often isn’t very easy. Of course, being an adult these days isn’t exactly a walk in the park either. Children are normally teased by their peers. 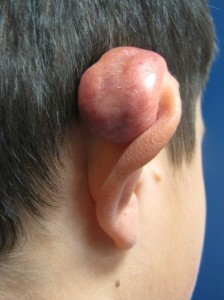 A child with a mental or noticeable physical aberration such as a large keloid or scar, prominent ears or a deformity can be brutally and relentlessly taunted by their peers. This can have both short and long term consequences including creating emotional and mental scars. Identifying and acknowledging the harmful effect such congenital and acquired deformities play in a child’s psyche, self-worth and behavior are critical in being able to constructively address the issues. This can be somewhat difficult as very often a child is too embarrassed to discuss being harassed and bullied. All that is needed then, of course, is a correction using plastic surgery. 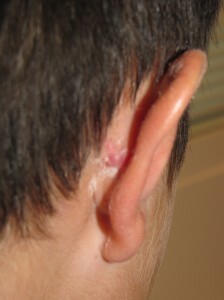 The following is a 10 year old patient who presented to me with a very large, prominent and deforming keloid of his right ear (Fig. 1). It had been present for several years and was a frequent focal point of ridicule by his classmates though it was nearly impossible to get him to admit to this harassment. During the entire consultation, he was severely withdrawn and quiet and the untoward emotional effects could be lucidly be perceived. He underwent successful surgical excision of the keloid with reconstruction and also had a steroid injection to help reduce the risk of recurrence (Fig. 2). Having been followed on a nearly monthly, there is no evidence of any recurrence and his ear is essentially normal in appearance. And … he is even smiling now and less withdrawn! If you would like more information on the treatment of keloids, scars or prominent ears or to schedule a consultation with me, please call my office at 480-451-3000.